I have been getting lost of use out of this infamous blanket scarf. I get lots of questions on Instagram about where I got mine because it seems to be sold out everywhere. I got mine from Nasty Gal but it is sold out. But the good news is Target and Sheinside have the exact same one. I linked both and a few others that I love below. And they are all so inexpensive. I bought these shoes during the Nordstrom clearance sale and I love them. They are still on sale! They are comfortable and they are different then anything that I had in my closet. I love the lace up sides and the cutouts. Also this shirt is not maternity! It runs a little on the big side so I would go down one size. But it is also still on sale. I think it is the perfect tunic for Fall. It would be great with leggings because it is so long. Thanks for stopping by and don't forget to enter yesterday's Duo Boot giveaway! Loving this whole outfit especially the shoes!! I love how you styled that plaid scarf! Gorgeous! That shade of red on you is fab! And your hair looks great - please do a hair curling tutorial! Those shoes are too fabulous! Red is so gorgeous on you! The heels are amazing too. Great look! Love this post! I am currently obsessed with plaid! Stunning look! So cool and inspiring! Love the lace-up design of the heels, so chic with an edge! 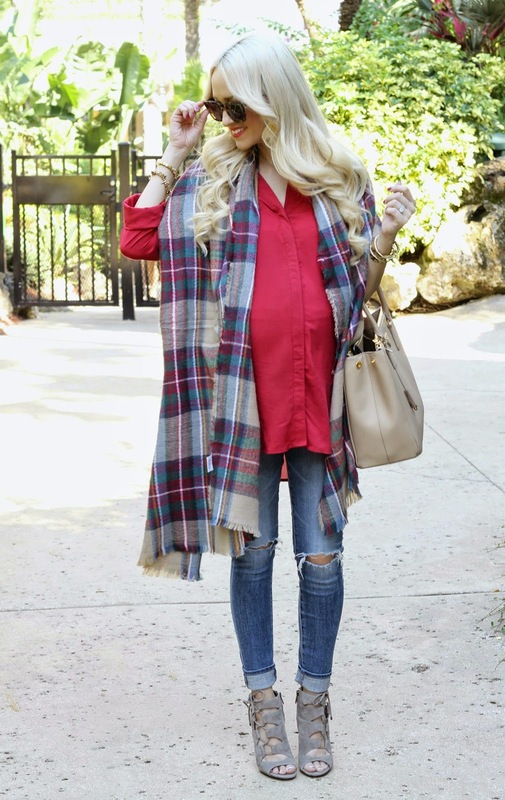 Cute plaid scarf too, perfect for fall!